Here at BPF, we get a lot of customers wanting to know more about our pop up socket range. So, we’ve put a guide together to help you out! So, what is a Pop up socket? Pop up sockets (as opposed to ‘pull up sockets’) are raised by pressing a central button / top disc. Once pressed, this then partially pops the unit up from the work top, before being raised the rest of the way by hand. 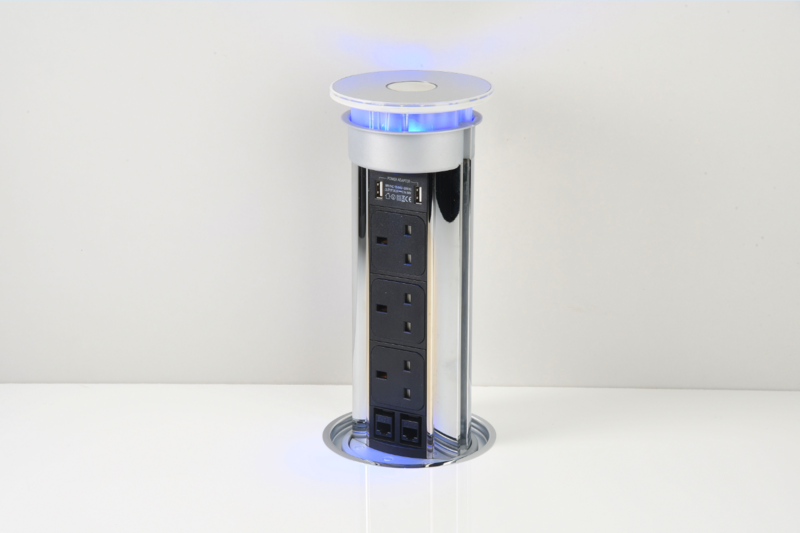 They are a new and advanced alternative to regular power sockets; offering LED lighting, Data and USB ports all combined into 1 single unit, preventing work top cable and wire clutter! Not only do their desirable combination of features make them such a popular product, but another behind their soaring popularity is that they are in-set to the worktop (rather than wall mounted), which makes them particularly suited to areas with limited space, such as kitchen counter tops. An additional benefit of this is that you wont need to pay eye watering prices to have tiles removed and cables and wiring redirected; pop up kitchen sockets are simply fitted through a worktop and then connected to a lower, pre-existent socket. So, whether you have a limited number of sockets in your kitchen, need more or you are looking to fit out a new one (without lining the walls with sockets), pop up sockets are your answer! As well as the plug socket height itself, another key consideration is the space underneath the unit! The space underneath is important as you will need to allow some room for wires and cables to run. For the surface space, you’ll need to consider the size of the hole required in your work top. It is vital that you know the hole size for the range you are thinking about buying, prior to cutting it. Due to the versatile nature of these pop up sockets, a variety of ports to accommodate other power outlets have now been built in. 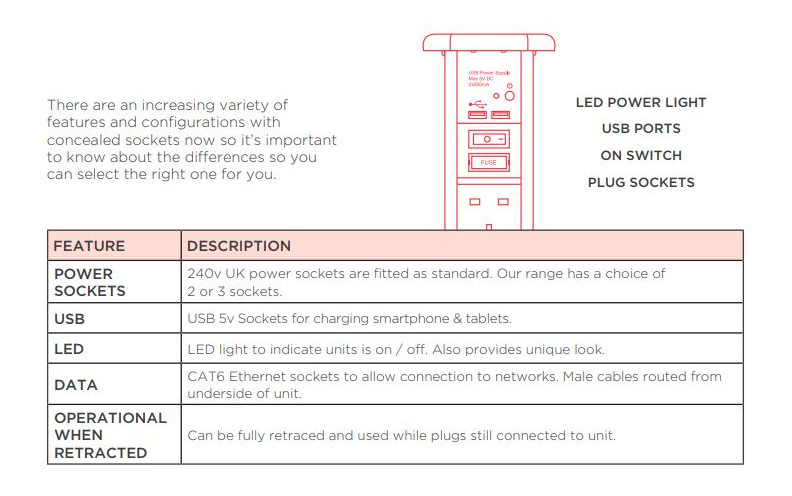 These features are available from USB, LED, Data and more! Are they flush fitting or raised? It is important to decide on this prior to your purchase. As standard, most concealed sockets sit slightly raised (by around 7mm) from the surface when retracted. Customers wanting flush fitted concealed sockets are better off looking at our Milan Range or Economy Range. The Milan range comes with a flush fit adaptor, allowing it to sit flush with the worktop. These adaptors are available in bright or matte chrome to match the pop up socket boxed with it. 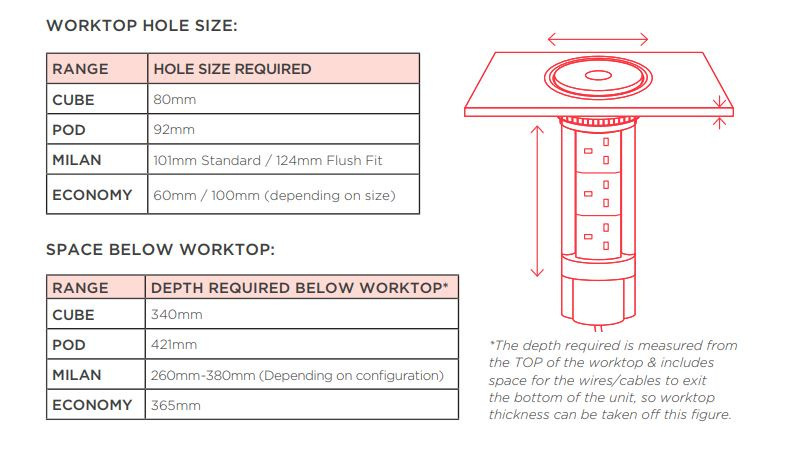 Please note: If you are installing a Milan unit with the flush fit adapter, you will need a hole diameter of 124mm (as opposed to 101mm when installing without). 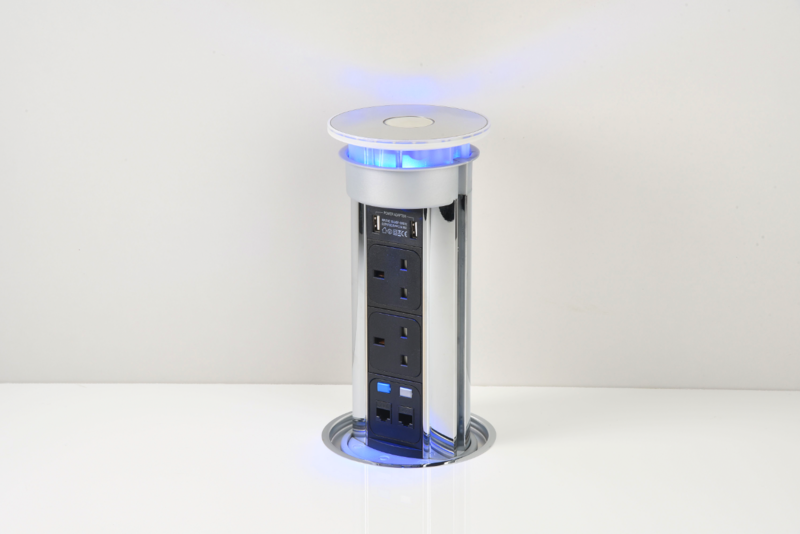 Can you push the pop up socket down with appliances plugged in? In short, no. However, our POD pull up sockets are designed to be stowed while plugs are inserted. It is worth noting that these POD pull up sockets are not flush fitting with the worktop which is why most customers opt for the Pop up units instead. Want to know more? Why not take a look at our helpful BUYING GUIDE; or get in touch via our CONTACT US page. You can fine a lot of helpful information on individual product pages; from descriptions, diameters and key features, to technical drawings, product ratings and FAQS!